G.I. Joe Collectors' Club - Updates! 09/26/2013 - G.I. Joe: Battleground launches Nemesis Rising event! With the defeat of Golobulus in Shanghai, Cobra-La's resurgence seems to have been ground to a halt. Nemesis Enforcer has awoken but is now without a master to take orders from. Without Golobulus's command, Nemesis Enforcer has become a wild card. As Joe and Cobra forces battle each other around the world, it has become clear that Nemesis Enforcer's intent is showering destruction all around him until he can be subdued by a new master. G.I. Joe: Battleground will introduce its first legendary rarity card – Nemesis Enforcer! Battle other players and reach the very top ranks for a chance to get this powerful new unit to your squads. You can download and play G.I. Joe: Battleground for free on iPhone, iPad, iPod touch and Android devices... Click Here! 09/18/2013 - G.I. Joe: Battleground launches Cobra-La Strikes Back event! Seething with anger that the Joe's destroyed his biological weapons facilities, Golobulus makes a deadly play to capture world leaders at a summit in Shanghai. It's up to the Joe's to launch a rescue and a Take Down of Golobulus before he harms any of the world leaders! Recruit the elite Sgt. Stalker and Mainframe to help you win the battle against the evil forces of Cobra-La. Download and play G.I. Joe: Battleground for free on iPhone, iPad, iPod touch and Android devices... Click Here! 09/16/2013 - GIJCC Magazine September Issue! Check out the cover of our September 2013 issue. Find out the origin of the Special Action Force operative: Bombardier. Other features include a 1st look at FSS 2.0 figure samples, product reviews, exclusive character dossier, Iceberg Chronicles and the latest Adventure Team comic saga! If you are not yet a member and want to get our monthly magazines and FREE annual figure, head on over to our Club store and purchase your membership... Join Today! 09/04/2013 - G.I. Joe: Battleground launches Wrath of Cobra-La event! Thanks to the courageous efforts of Snake Eyes and other Joes, they have discovered that Cobra-La did not perish as originally thought and that the threat of a Cobra-La resurgence is very real. Using data obtained from Shipwreck's commando raid, the Joes were able to pinpoint the Cobra-La's revival to a remote region of the Himalayan mountains. Now the Joes gather their most elite squads for an all-out assault on Cobra-La's clandestine operation. Are the Joes ready to face the dangers of Cobra and Cobra-La's forces in their underground burrows and put an end to return of this ancient evil race? 08/22/2013 - G.I. Joe: Battleground launches Shipwreck'd PvP event! After the Joes successfully decrypted the Cobra data obtained by Snake Eyes, they learned a frightening truth. Cobra-La is still alive, active, and seething with anger and hatred for G.I. JOE. In response to this grave threat, Joe teams from around the world have scrambled to launch various assaults against known Cobra intel centers to obtain information on the whereabouts of Cobra-La. One such perilous mission involves Shipwreck and a team of commandos finding their way onto a Cobra submarine. A close quarter firefight breaks out on the sub that threatens to blow up the nuclear powered titan with all combatants still on board. Take up a side as Joe or Cobra and fight against other Squad Leaders. Will you side with Cobra to protect Cobra-La's nefarious plans, or will you go with the Joes to unravel and put an end Cobra-La's comeback? You can download and play G.I. Joe: Battleground for iPhone, iPad, iPod touch and Android devices for free... Click Here! 08/06/2013 - GIJCC Magazine August Issue PREVIEW! Members will be receiving the August Issue of the G.I. Joe Collectors' Club Magazine over the next couple of weeks and we have some great features for you in this installment! You get a first look at two final sample figures from FSS 2.0. Two great interviews, one with David Phan, the Producer on the G.I. Joe: Battleground mobile game and another with Corey Burton, voice of Tomax from the 80's G.I. Joe cartoon. Fiction wise, Part 2 of the Iceberg Chronicles and episode 31 of the Adventure Team Chronicles! And of course, another great exclusive G.I. Joe dossier and the latest previews from Hasbro! If you are not a member, it's easy and only takes a couple minutes. So go ahead and jump on board... Join Today! 08/05/2013 - G.I. Joe: Battleground launches The Dreadnok Trials event! DeNA and Hasbro are excited to bring Battle Simulator ­ The Dreadnok Trials event to G.I. Joe: Battleground. This time around, the JOES have control of the Battle Simulator. JOE Squads from around the world are in for a tough challenge with a Dreadnok program that introduces some mean customers including Road Pig, Burn Out and Zanzibar. These anarchists are going to go all-out on JOE Squads, so bring your "A" game if you want to make it through the truly lethal top floors of this Battle Simulator. Top players will earn the hyperactive and deadly accurate Metal Head to add to their Cobra Squads. 08/02/2013 - GIJCC Store Mid-Summer Sale! Check out the BIG Mid-Summer sale at the G.I. Joe Collectors' Club online store. Over seventy items are at reduced prices. This is a great chance to pick up some items you may have passed on before. Now is the perfect time to add them to your collection! Make sure to visit the GIJCC Store for all the summer sale items... Click Here! 07/31/2013 - Snake Eyes throws ceremonial first pitch at Oakland A's game to celebrate the Blu-ray/DVD release of G.I. Joe: Retaliation! Snake Eyes (actor Ray Park), one of the original and most popular members of the G.I. JOE team, throws out the ceremonial first pitch at Oakland Coliseum on Tuesday, July 30, 2013 in Oakland, Calif., to celebrate the debut of G.I. Joe: Retaliation on Blu-ray, DVD and Digital formats from Paramount Home Media. Check out the YouTube video... Click Here! 07/25/2013 - G.I. Joe: Battleground launches Global Warfare event! All over the world, skirmishes are erupting between G.I. Joe and Cobra. Cobra forces are relentlessly causing havoc and it's up to the Joe's to put a stop to Cobra's campaign of terror. Take-up a side and fight with your Joe Squad against other players' Cobra Squads or if you're feeling a little nasty, use your Cobra Squad to battle against other players' Joe Squads. Whichever side you choose, you will be fighting for supremacy against other players from around the world. Fight for freedom or fight for oppression, but make sure you fight hard for the top reward of Cobra Commander with his high-powered battle armor! Download G.I. Joe: Battleground for iPhone, iPad, iPod touch and Android devices for free... Click Here! 07/18/2013 - G.I. Joe: Battleground launches Operation: Takedown event! For too long Destro has been allowed to operate his arms manufacturing with impunity. He has grown so wealthy and powerful from this operation that he's made this armory into a lavish and deadly home base. Working from international intelligence reports, the Joe's have formed a Strike Force led by the courageous Dusty and stalwart Gung-Ho to launch an assault on Destro's armory! Join them on this dangerous takedown operation of one of Cobra's most powerful and ruthless leaders. Be careful though, Destro won't go down without a fight, and he doesn't like unannounced visitors! Play the G.I. Joe: Battleground mobile game for free... Click Here! 07/17/2013 - G.I. Joe: Retaliation Avatar Creator Sweepstakes! Paramount has announced a contest that allows you to create your own G.I. Joe and then enter the sweepstakes for a chance to win a custom Hasbro action figure of your creation and other prizes. Pick your weapons, clothing and facial features to create your own G.I. Joe or Cobra design! Visit the official "Build-A-GIJoe" website to enter the contest... Click Here! 07/16/2013 - Hasbro announces 2013 SDCC Press Release & Activities! Hasbro and Paramount Home Media Distribution will welcome stars and filmmakers from the blockbuster G.I. JOE: RETALIATION movie to the Hasbro booth to celebrate the upcoming July 30 release of the Blu-ray, Blu-ray 3D and DVD. Fans will have the chance to get an autograph from the film’s director, Jon M. Chu on Thursday, July 18 at 4:00p.m. and actor Ray Park, who plays the iconic SNAKE EYES ninja on Friday, July 19 at 3:30p.m. Tickets are required for the sessions and will be distributed beginning at 9:00a.m. on the morning of the events in the Hasbro booth while supplies last. Fans can also visit the Hasbro booth throughout Comic-Con to get an up close look at the entire G.I. JOE: RETALIATION line including new items available this fall. Check out all the events and details in the official Press Release... Click Here! 07/08/2013 - DeNA launches G.I. Joe: Battleground Game! DeNA and Hasbro have released G.I. Joe: Battleground, a free-to-play action card battle mobile game based on the original G.I. Joe universe on Google Play for Android mobile devices and on the App Store for iPhone, iPad and iPod touch. Available now... visit the official website and choose your device to download this exciting mobile game for free... Click Here! 06/25/2013 - GIJCC Exclusive Card for DeNA's G.I. Joe: Battleground! DeNA will release the new G.I. Joe: Battleground Strategy RPG Game where YOU recruit and lead a team of legendary heroes or villains to protect or control humankind. Check out our exclusive card and make sure to pre-register for this great mobile game... Click Here! 06/05/2013 - Hasbro announces 2013 San Diego Comic-Con Exclusives! USA Today is showcasing the 2013 San Diego Comic-Con exclusives from Hasbro that includes a 'G.I Joe vs. Transformers' package. This year's set is a G.I. Joe Skystriker with a paint job inspired by the Autobot, Jetfire, V.A.M.P. vehicle as Autobot Hound, Decepticon Bludgeon, Baroness with Decepticon Ravage, and Snake Eyes action figures. Take a look at all these great 2013 San Diego Comic-Con Hasbro exclusive products... Click Here! 06/05/2013 - GI Joe: Retaliation to be released on Blu-ray, Blu-ray 3D, DVD and On Demand July 30, 2013! G.I. Joe: Retaliation will be released on Blu-ray, Blu-ray 3D, DVD and On Demand July 30th, 2013 and on Digital two weeks early on July 16th. The blockbuster film, which stars Dwayne Johnson, Channing Tatum and Bruce Willis, made over $355 million worldwide. Check out all the details and special features by reading the full Paramount Press Release... Click Here! 05/24/2013 - DeNA Studios announces G.I. Joe: Battleground game! Battle against your enemies in G.I. Joe: Battleground, a richly illustrated strategy RPG game where YOU recruit and lead a team of legendary heroes or villains to protect or control humankind. Coming soon - FREE for iPhone, iPad and Android. Pre-register to get the rare and elusive Storm Shadow card when G.I. Joe: Battleground is released... Click Here! 05/23/2013 - FSS 2.0 Deadline Extension Period! Because there was an issue with the server's time clock (the server closed one hour early), we will open the FSS 2.0 for 2 hours tonight from 9PM Central time to 11PM Central time. We must cut this off as we have to get the manufacturing quantities to the factory. Please do not call the office as we cannot place your orders for you. if you have a cc issue tonight, we do not guarantee that we can resolve it. You need to find out what the issue is with your card company and resolve it before 11pm tonight. No orders will be taken after 11pm tonight - no exceptions. In the future, please do not wait until the last day (or hour to place an order). The order period was 22 days long. This way, you have time to resolve any cc issues that may occur. Thanks for understanding. 05/22/2013 - FSS 2.0 Deadline and Oktober Guard Flamethrower Specialist: Dragonsky... Did you Know? The G.I. Joe Collectors' Club has another exclusive action figure spotlight from our second Figure Subscription Service (FSS 2.0). Want to know the history about the Oktober Guard Flamethrower: Dragonsky? You can learn the origin of this highly requested classic Oktober Guard team member and then check out our preview of his 25th-Anniversay card artwork... Click Here! Don't miss out, the Figure Subscription Service is a "build to order process" so you can order as many as you like, until the order period closes! 05/21/2013 - FSS 2.0 Admiral: Keel-Haul... Did you Know? The G.I. Joe Collectors' Club is proud to spotlight another exclusive action figure from our second Figure Subscription Service (FSS 2.0). Want to know the history about Admiral: Keel-Haul? You can learn the origin of this highly requested G.I. Joe Admiral and then check out our preview of his 25th-Anniversay card artwork... Click Here! Only one more day to get your subscription in for the FSS 2.0 sign-up period (ending at Midnight Central time on Wednesday, May 22nd)! 05/21/2013 - FSS 2.0 Oktober Guard Anti-Armor Specialist: Big Bear... Did you Know? The G.I. Joe Collectors' Club has another spotlight on a exclusive action figure from our second Figure Subscription Service (FSS 2.0). Want to know the history about the Oktober Guard Anti-Armor Specialist: Big Bear? You can learn the origin of this highly requested Oktober Guard action figure and then check out his 25th-Anniversay card artwork... Click Here! 05/20/2013 - FSS 2.0 S.W.A.T. Specialist: Wide Scope... Did you Know? The G.I. Joe Collectors' Club is proud to spotlight another exclusive action figure from our second Figure Subscription Service (FSS 2.0). Want to know the history about the S.W.A.T. Specialist: Wide Scope? You can learn the origin of this highly requested new-sculpt era S.W.A.T. soldier with K-9 partner and then check out our preview of his 25th-Anniversay card artwork... Click Here! 05/20/2013 - FSS 2.0 Cobra Industries C.E.O. : Cesspool... Did you Know? The G.I. Joe Collectors' Club has another spotlight on a exclusive action figure from our second Figure Subscription Service (FSS 2.0). Want to know the history about the Cobra Industries C.E.O. : Cesspool? You can learn the origin of this highly requested Cobra Industries C.E.O. action figure and then check out our preview of his 25th-Anniversay card artwork... Click Here! Plus, we have an exclusive first look at the NEW prototype head sculpt created for FSS 2.0 Cesspool... Click Here! 05/18/2013 - FSS 2.0 Tiger Force: Shipwreck... Did you Know? The G.I. Joe Collectors' Club is proud to spotlight this fan favorite action figure from our second Figure Subscription Service (FSS 2.0). Want to know the history about Tiger Force: Shipwreck? You can learn the origin of this highly requested international Tiger Force action figure and then check out our preview of his 25th-Anniversay card artwork... Click Here! Add all these great FSS 2.0 action figures to your collection. Make sure to subscribe before the May 22nd deadline... Click Here! 05/17/2013 - FSS 2.0 Combat Engineer: Tollbooth... Did you Know? The G.I. Joe Collectors' Club has another spotlight on a exclusive action figure from our second Figure Subscription Service (FSS 2.0). Want to know the history about the Combat Engineer: Tollbooth? You can learn the origin of this highly requested vehicle driver action figure and then check out our preview of his 25th-Anniversay card artwork... Click Here! Plus, we have an exclusive first look at the NEW prototype head sculpt created for FSS 2.0 Tollbooth... Click Here! 05/16/2013 - FSS 2.0 Range-Viper Commander: Skull Buster... Did you Know? The G.I. Joe Collectors' Club is proud to spotlight another exclusive action figure from our second Figure Subscription Service (FSS 2.0). Want to know the history about the Range-Viper Commander: Skull Buster? You can learn the origin of this highly requested Cobra action figure and then check out our preview of his 25th-Anniversay card artwork... Click Here! Also, we have an exclusive first look at the NEW prototype head sculpt created for FSS 2.0 Admiral Keel-Haul... Click Here! 05/15/2013 - FSS 2.0 Tiger Force: Airtight... Did you Know? The G.I. Joe Collectors' Club is proud to spotlight this exclusive action figure from our second Figure Subscription Service (FSS 2.0). Want to know the history about Tiger Force: Airtight? Don't forget that you have just a little over a week to place your order for the FSS 2.0. Order deadline closes on May 22nd! 05/10/2013 - FSS 2.0 Night Force: Lt. Falcon... Did you Know? The G.I. Joe Collectors' Club is proud to spotlight this fan favorite action figure from our second Figure Subscription Service (FSS 2.0). Want to know the history about Night Force: Lt. Falcon? You can learn the origin of this highly requested Night Force action figure and then check out our preview of his 25th-Anniversay card artwork... Click Here! Plus, we have posted full previews of all twelve of the FSS 2.0 action figures. You can subscribe now: May 1st through the 22nd... Click Here! 05/01/2013 - GIJCC announces FSS 2.0 Line-up and Subscription Deadline! After the fantastic success of FSS 1.0, the G.I. Joe Collectors' Club now brings you version 2.0! The FSS is only available to active club members. This service is an optional feature and is not included in the cost of your annual GIJCC membership. The FSS 2.0 subscription set will consist of twelve different carded 3 3/4" figures. You will receive six shipments starting in approximately September/October of two figures each month. Figures will be shipped in a surprise sequence (figure pairs will be the same for everyone each month). It will be a surprise each month as to which figure pair you receive! Your last shipment (6th shipment) will include your FREE mystery carded 13th figure! You can subscribe now: May 1st through the 22nd, and we will be showcasing all the figures throughout the deadline... Click Here! 04/17/2013 - Official 2013 G.I. Joe Convention Photos! We had a fantastic show in Indianapolis and want to thank everyone that attended the event. If you could not make it this year, we have full coverage on the official convention website with many photo galleries showcasing all the entertaining people that make the show and hobby fun. Check out all the photos at the official 2013 GIJoeCon website... Click Here! 03/27/2013 - G.I. Joe: Retaliation Advanced Movie Screenings! Paramount Pictures has sent out promotional updates for advanced screenings of the new live-action G.I. Joe: Retaliation movie. Fans and movie-goers should check their local theaters to see the movie ahead of its scheduled March 29th release date. For more updates and information, check out the official G.I. Joe: Retaliation movie website... Click Here! 03/18/2013 - FSS 1.0 Monthly Shipment Update! We are back on track for the March figure releases and have started shipping preparations. Please keep your address current by logging in and updating your address... Click Here! In addition, for those of you on the installment plan, please make sure your credit card on file is correct and will handle the final charge for your subscription(s). The final billing date is March 25th, 2013. 03/12/2013 - GIJCC Membership deadline is March 16th, 2013! Don't forget to renew your GIJCC membership so that you are current on March 16th to receive your FREE annual figure. Choose either the 3 3/4" Iceberg or 12" Comrade of Action that will be shipped to you later in the Spring. Make sure to sign-up or renew before the deadline. Click the thumbnail image to see a preview of the 3 3/4-inch Iceberg figure and for a preview of the 12-Inch Comrade of action figure... Click Here! 02/22/2013 - Official 2013 G.I. Joe Convention Registration & Hotel Updates! We have run out of rooms again and are on our third block at the Courtyard Marriott (also attached to the convention hotel the JW Marriott). Check the convention hotel page for the latest reservation link. For Exhibitors, the deadline for the discounted multi-booth price is next Friday, March 1st. Please get your registration completed before that date to take advantage of the lower pricing. The latest count on the 12" Secret Mission to Dragon Island is: 16 total sets left, which includes attending and non-attending. If you want this set, you need to move quickly as they will be gone soon. 02/18/2013 - Official 2013 G.I. Joe Convention Set Updates! We have sold out of the American Hero Nocturnal Fire boxed sets (attending), Loose Nocturnal Fire sets (attending), Homefront Hero Nocturnal Fire boxed sets (non-attending), and Loose Nocturnal Fire sets (non-attending). If you are interested in these sets, we have started a waiting list and to be on that list you must email admin2@funpubinc.com as we make a few extras to cover potential damage. If we don't use all of these reserve sets, we will contact you in the order of the emails received 6-7 weeks after the convention. In addition, there are less than thirty (total) Secret Mission to Dragon Island 12-inch sets left. If you want to add a tour or souvenirs, you may log in and add to your order by using the package bypass to get past the package screen. Then you can add movie tickets, tours, T-shirts and hats. Please note that the KRE-O Build-off event is also sold out. There is also a second room block at the Fairfield Inn & Suites. 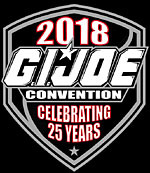 Make sure to visit the official 2013 GIJoeCon website and click the Hotel tab for reservation information. This hotel is a couple of blocks away attached by the skywalk. 02/15/2013 - G.I. Joe: Retaliation Movie Action Figure Gallery! G.I. Joe: Retaliation will be in theaters on March 29th, but you don’t need to wait to see the stars from the movie cast as G.I. Joe characters. Plus, you will find fan-favorite classic and new characters in multiple waves that are set to be released throughout the spring and fall 2013. We have added a photo gallery for your quick reference on all the great G.I. Joe: Retaliation 4-inch action figures... Click Here! 02/15/2013 - Hasbro 2013 Toy Fair G.I. Joe Product Previews! It's been a great news week and we wanted to re-cap all the new G.I. Joe product preview highlights that Hasbro showcased at the 2013 Toy Fair event. Check out our re-cap photo gallery of all the great 2013 G.I. Joe products hitting store shelves this year... Click Here! 02/09/2013 - Hasbro 2013 Toy Fair: Eaglehawk Chopper Spotlight! The Eaglehawk Assault Chopper is the most dominating vehicle to transport your squadrons to battle. Each camouflaged chopper comes equipped with an 4-inch action figure to pilot your most critical missions. Check out this full preview of the return of this iconic Real American Hero helicopter... Click Here! 02/09/2013 - Hasbro 2013 Toy Fair: 12-inch Figures Spotlight! Coming this fall, these highly-detailed 12-inch movie action figures are the largest-scale figures in the 2013 line. Choose from the iconic Snake Eyes, Roadblock or Storm Shadow. Figures sold separately. Check out a preview of all three of these new 12-inch action figures... Click Here! 02/09/2013 - Hasbro 2013 Toy Fair Information! We are very excited to reveal the latest news from Hasbro at the 2013 Toy Fair event happening this weekend in New York City. Keep watching our site for the latest G.I. Joe product information and photos. The read the full Hasbro 2013 press release with the upcoming G.I. Joe product announcements... Click Here! 02/06/2013 - GIJoeCon 2013 Registration is Online! Registration for GIJoeCon 2013 is now online at the convention website! All attendees, non-attendees and vendors can purchase convention packages and exclusive apparel for this terrific event. While supplies last! Click the thumbnail image to visit the GIJoeCon website and register for the upcoming show. 01/28/2013 - Jim Wallwork Memorial! We are sad to report that Jim Wallwork, the decorated D-Day glider pilot passed away at the age of 93. Jim was our special guest at the 2001 G.I. Joe Collectors' Convention in Kansas City. We would like to honor his military service and for sharing his story of the historic assault on Pegasus Bridge in Normandy France on June 6, 1944, D-Day. Click the thumbnail image to read the news story about his life and how to make a donation on his behalf. 01/21/2013 - GIJoeCon 2013 Brochure is Online! We are very excited to announce that our Official 2013 G.I. Joe Collectors' Convention information brochure is available for the upcoming show in Indianapolis, IN! Keep watching the official convention website this week for the box set and action figure previews. Plus, we will be announcing when online registration is available! 01/17/2013 - 1st Shipment FSS 1.0 singles available at GIJCC Store! We have put the first months shipment of the single FSS 1.0 figures in the Club Store... Click Here! For our 12" fans we also have: 12" Jungle Incursion Figure (1 pc) limited to 1 per membership $36 each! 01/07/2013 - GIJCC FSS 2nd Month Delivery Update! We are getting ready to prepare the second shipment. We anticipate they they will ship about two weeks from now. Please have any address changes in the system by Wednesday (1/09/13) at 5pm Central Time. Also, we are planning to do the installment billing for the second payment on or about January 21st. Please ensure that your credit card information is correct and that your debit cards have enough funds. Everyone's billing amount is different so please refer to your first invoice to know what your amount will be. If you don't have your invoice, you can log in and look at your order... Click Here. For those of you who paid in full, you can ignore the billing information. Thanks for your support! We hope that you are enjoying your first figure shipment!